After days of research and talking with a number of classroom teachers who experience the heaviest use of pencil sharpening. I conclude that you have 7 choices when choosing a pencil sharpener. None, with the exception of one, have a unanimous vote. 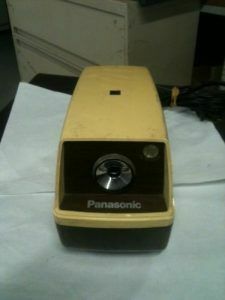 The most beloved pencil sharpener would be a Panasonic KP-33. But since it is an old discontinued model there's a high chance you will not be able to get it. In this article I'll explore some alternatives, trying to balance quality, longevity and the limited budget a lot of us have. There are countless stories of people using this model for years. Even handing it down from father to son. The KP-33 is made from strong, durable metals. Under the hood you will find zero cheap plastic. That is often the cause for many of the modern electric pencil sharpeners breaking down. This model is not just a good electric pencil sharpener and I apologize for being preachy. But for many this sharpener symbolizes a time where quality came before capitalism. If you can not get this model I suggest you look for similar Panasonic products. I believe this model is primarily popular because it's cheap. 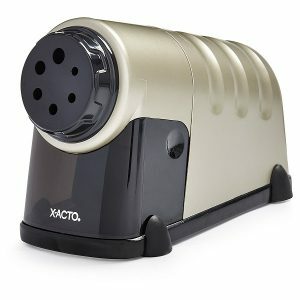 The X-acto School Pro Heavy-Duty can collect a lot of shaving before needing emptying. But quality seems to be vary from days to a few months. Anything exotic seems to choke it up. The wax or binding agent in colored pencils will clog it up. Same goes for special coatings on pencils. Best used with regular graphite pencils. 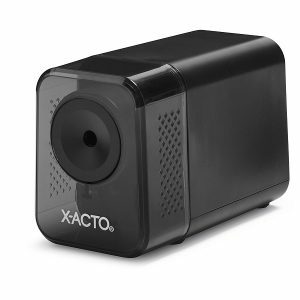 Unlike it's older brother, the X-Acto School Pro Heavy Duty, the XLR has only one hole. Suitable for standard pencils. It's also with a cord so no need to worry about batteries. Like other X-Acto products it's made in china and the parts aren't always top notch quality. When it works it sharpens equally but sometimes one side isn't quite finished and you have to manually help it. Unlike School Smart it's sensitive to extended sharpening and will save you some pencils in the future. It's okay for the price. But we want something better don't we? Now this is a beast and I find this model redeems the X-Acto brand. Although still not perfect and with a relatively high volume of noise when working, this is our preferred choice from X-Acto. The design doesn't offend most classrooms and the multiple sizes it accommodates are just to be expect at this price. It's also with a cord and will last you years due to it's heavy design. Another uninspired design choice is the Heavy Duty by Artist Choice. On top of well not being very aesthetically pleasing it also uses 4 batteries to function. When the batteries are full you can expect a quiet machine that will sharpen your pencils beautifully. But as the batteries decline so does the power that goes into sharpening and you will experience a less than perfect cutting. Great choice for home and your personal office but not so great for truly heavy duty work. Now the Linkyo is a promising choice. Powered via a cord with an outlet. This pencil sharpener has a unique design which is refreshing. Maybe it's a unique machine? It doesn't have multiple holes but luckily most people don't really need them either. Standard graphite pencils and colored pencils fit just fine. But Linkyo too is not without fault. It's almost as if these companies have done the math and calculate that most people can't be bothered to ship the product back? Particularly if it's a cheap item? Last but definitely not least is School Smart. Their products come highly recommended our review is universally positive and overwhelming. All of their sharpeners come with a cord which is our preference. The design is acceptable and it's simplistic. But what is the downside? It's a strong, heavy, durable monster of a machine but it eats away at the graphite and unlike the X-Acto devices it doesn't have an indicator for when it's done. Frankly I think we're spoiled as a species if we require our sharpener to tell us when it's done. 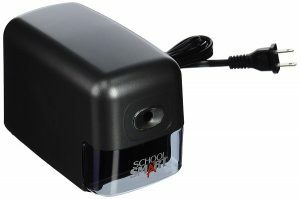 This is a great pencil sharpener for home, school or office use. And yes, it's not perfect but so far I haven't seen a machine that is. So far I think this is the best we'll get. First you need to figure out what size pencil you use. Most pencils are 8 mm in diameter while some bigger pencils may be up to 10.5 mm. We're going to assume that you need a pencil sharpener for a default 8 mm pencil. 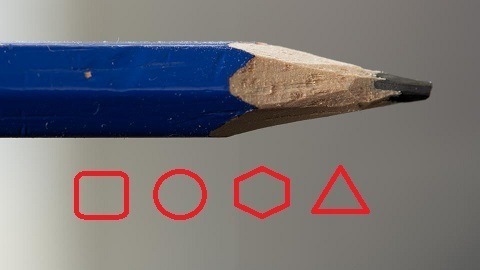 You have probably noticed that pencils come in different shapes. 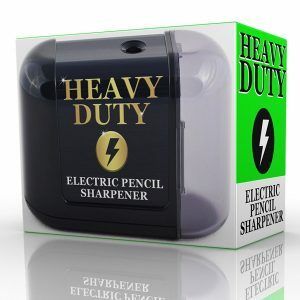 Although most sharpeners can sharpen a pencil regardless of their form (circular, hexagonal, triangular) you may on occasion come across an eletric pencil sharpener that’s designed for a specific cosmetic purpose. The angle or depth of a sharpener is another concern for the purist pencil user. The advantage of a deeper angle is clearly longer usage but with the vast majority of users being young children in school you might want a smaller angle which will fit younger kids more by allowing more pressure and heavy use. Some sharpeners will give you a super fine lead tip which might be great if you’re a fine artist but if you’re a student or maybe a craftsman you may prefer a sturdier, blunt and rounded tip. Another concern for the purist pencil lover is the quality of the sharpening. A bad blade can cause your lead to break more often. Another concern with low quality blades is the rugged finish you sometimes see. Where the wood hasn’t been perfectly cut off and left rough edges. A similar concern although less frequent is graphite not going to the disposal bin and compromising the look of your pencil by leaving marks on the wood. Colored pencils differ from regular carbon based pencils because their lead is made of wax and colorant. That means that unless you take proper care of your pencil sharpener the wax and colorant will gum up your sharpener and render it useless. In order to protect and maintain the device experienced teachers recommend you occasionally run a graphite pencil through to clean the sharpening blades of excess wax and pigment. Any cheap graphite pencil will suffice for this purpose.Additional note: If you notice that your colored pencil leads are breaking then that’s probably because the lead is broken already. This will be a more common problem with more expensive colored pencils because cheaper pencils will still have a version of a graphite lead instead of a pure wax and pigment one. Since colored pencils are made primarily of wax they will harden if you put them into a refrigerator for the night before sharpening. Should you encounter that your pencil has a broken lead, try heating it to refuse the lead. Also check out "​Art of Pencil Sharpening" It's funny! Regardless of what you end up choosing it’s important to remember that you need to take care of your sharpener and possibly keep it out of the hands of the children if they are young enough to use the sharpener in a way that it’s not meant to be used (the rubber end of the pencil). 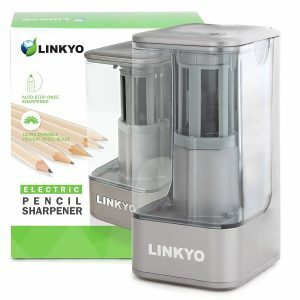 We suggest that you get a more expensive electric pencil sharpener instead of a cheap one that likely was designed to fail. 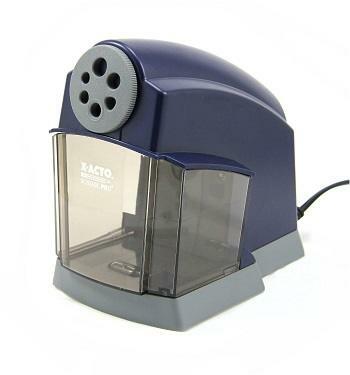 If you can’t afford risking buying an expensive electric pencil sharpener, I would suggest you go the mechanical sharpener route. They are generally built to last and will attract less curious children.